My mom has said that I get my baking skills from my grandmother (and that they skipped a generation). I don’t know if that’s true, but I do know that I have many fond memories of the delicious baked goods that came from Grandma K’s kitchen. Grandma K didn’t often write a recipe down. Her wrinkled hands knew how the dough should feel. Her nose knew what it should smell like. Her eyes could spot if the dough was too wet or too dry. But, every once in a while, with enough asking, she’d agree to write down what she did. I only have a few of those recipes, and I cherish them. One of them was for her banana bread. I think I’ve finally come up with a gluten-free banana bread recipe worthy of carrying her name. No special “healthier” sweeteners here. Grandma K used sugar – the white stuff – and for this recipe I’ve followed suit. I’m using one ingredient Grandma K never would have thought of – agar flakes. Agar is a seaweed, and it is used as a replacement for gelatin in many vegan recipes. I buy it in noodle shapes in the Asian grocery store, and then grind it in a coffee grinder. It’s fairly cheap when purchased and prepared that way. I would guess you could also use gelatin, but I’d reduce the amount by about half. The agar works to bind the flours, much like a gum would. Without it, your bread will probably fall and may not hold together. 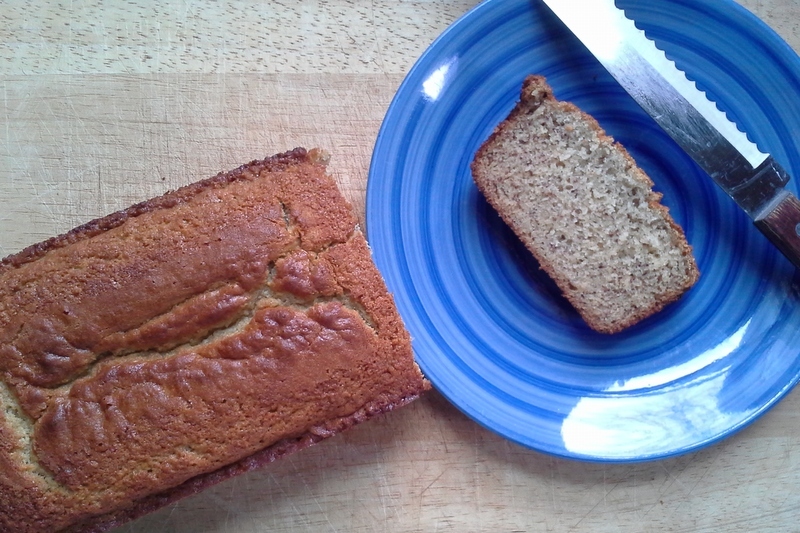 Fresh banana bread – the perfect fall treat. Preheat the oven to 350°. Grease a standard loaf pan. In a measuring cup, mix the almond milk and apple cider vinegar. Set aside. In the large mixing bowl, beat the bananas until they are fully mashed and becoming liquidy. Add the Earth Balance and beat until it is fully incorporated. Beat in the sugar and the eggs. Add the dry ingredients and mix well. Finally, pour in the sour milk and beat until the batter is smooth. Scrape into prepared pan. Bake in preheated oven for 45-60 minutes*. Remove from oven and cool in pan for 10-15 minutes. Remove from pan and cool completely before cutting. This entry was posted in bananas, bread, breakfast, desserts and tagged banana bread, gluten-free, recipes. Bookmark the permalink.